A 28.65 metre Sanlorenzo motor yacht, listed for sale by Steve Martin at yachtBlue, the brokerage division of Sanlorenzo Americas, has had a $500,000 price reduction. Built in GRP by Italian yard Sanlorenzo to RINA class, she was delivered in 2012 as an SL94 flybridge model. An interior in bleached oak lends her a beach club look accommodating nine guests in four cabins consisting of a main deck master suite, VIP suite and two twin cabins plus a Pullman berth, all with marble en-suite bathrooms. In addition, there are quarters for four crew on this yacht for sale. The open-plan saloon has a lounge area with an L-shaped settee to port facing a starboard entertainment centre including a large flatscreen television screen, while other amenities include a full bar with an icemaker and fridge, and forward is a formal dining area with seating for eight guests. Further forward still, the galley hosts a dining table seating four guests for casual snacks. More casual dining is available on the aft deck where upholstered bench seating and two upholstered arm chairs offer all the necessary conveniences for al fresco relaxation. Up on the flybridge is a range of sun loungers, a bar and a television screen on a rise and fall mechanism. The yacht features tropical air conditioning throughout and is powered by twin 2,200hp MTU diesel engines giving her a cruising speed of 25 knots. The engines are warrantied through to April 2018 and zero-speed stabilisers are fitted. 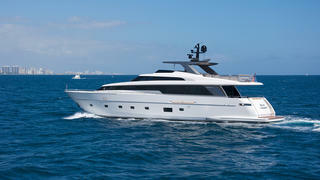 Lying in Fort Lauderdale, Florida, the Sanlorenzo SL94 is now asking $5,450,000.